Ginseng supplements, popular with consumers for their perceived energy-boosting benefit and effectiveness against the common cold, often carry less ginseng than indicated by their labels and have other ingredients, according to a newly released report. 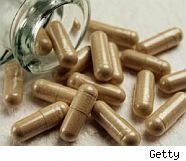 ConsumerLab.com, an independent testing organization that reviews health and wellness products, selected 11 supplements and found that five were either contaminated with lead and pesticides or did not contain the amount of ginseng they claimed. The findings stress a recurring pattern of problems with ginseng supplements, which the company has reported since 2000. "People should recognize that there is enormous variation in the amount of ginsenosides -- key ginseng compounds -- in marketed supplements," said Dr. Tod Cooperman, president of ConsumerLab. "We found most products to provide between 10 to 40 mg of ginsenosides per day, but some yielded much higher amounts, including one that delivered a whopping 304 mg."
ConsumerLab recently evaluated muscle-building supplements, also with mixed results. Ginseng is widely used in the United States on the belief it can improve overall energy and vitality, particularly during times of fatigue or stress. While there is no meaningful scientific evidence to support an energy-boosting claim, preliminary evidence suggests American ginseng and Korean Red Ginseng may reduce blood sugar levels in people with diabetes. Studies have also shown that when combined with Ginkgo biloba, Asian ginseng may help reduce the chance of colds and flus. Other claims of various forms of ginseng with weak or contradictory supporting evidence include improving mental function, strengthening the immune system, and combating symptoms of attention deficit-hyperactivity disorder (ADHD) in childen. Ginseng has estimated U.S. sales of $83 million, according to Nutrition Business Journal. Some in the supplement industry have suggested ConsumerLab is biased because, in addition to doing independent testing for its reviews, it also does testing for companies who pay to have their products tested in its certification program.